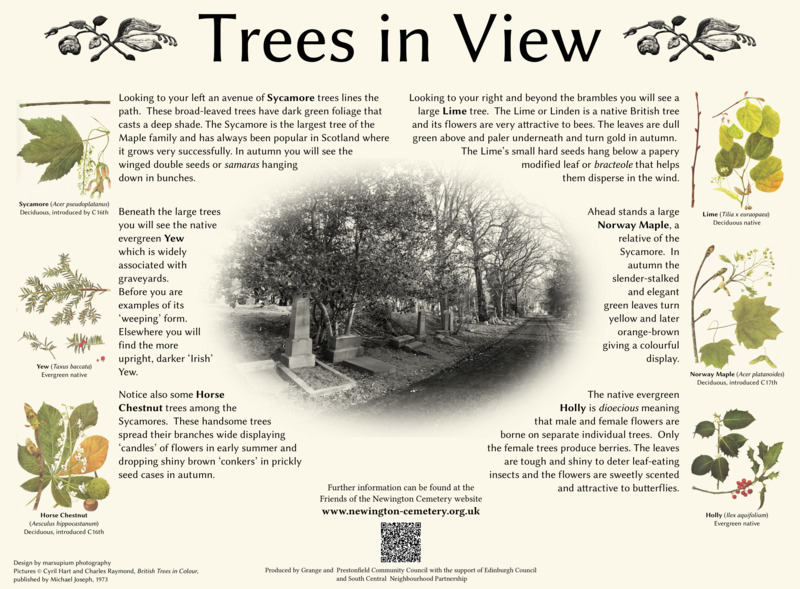 To discover more about the trees in the cemetery take a walk south-eastwards along paths to the new sign. It stands beside the path adjacent to the War Memorial. From the main gate walk over to the path around the central circle of graves. Join the path around the circle and follow it round past the unmissable pine tree to the other side, This HUGE tree (Pinus nigra) stands above the MacTaggart and Caw graves. At the other side of the circle take the straight path to your left. Close by you will see a large Walnut tree (Juglans regia) one of two in the cemetery. Follow this path and it will lead you slightly downhill towards another path intersection. Here choose the right fork and walk in the direction of the large rectangular stone War Memorial. You will find the new sign standing slightly to the right of the path. It describes the Trees in View from this particular spot.